Pocket Calendars are finally listed in the shop again. Flying teacups, those I wish (and many of them) for the coming year. 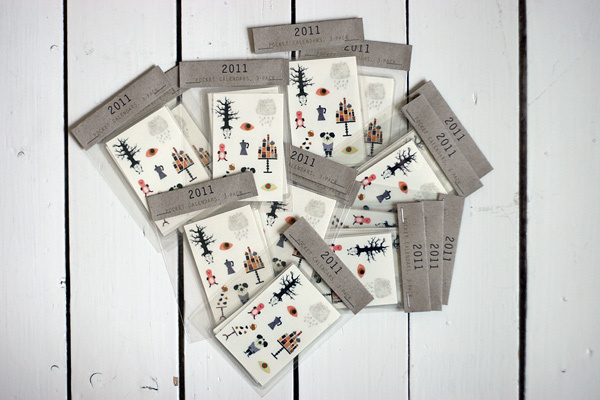 Your pocket calendar of this year is on my table as many other treasures. The small branch of black round seeds. Hej Sandra, good good! Your shop looks so nice. Hope you'll have a nice Tuesday evening, here a soup is boiling. Yeah! Cool! Bravo! Hurra! Jippi! and they come with such a eye-candy packaging !! Thank you for mine! And your wrist worms arrived just in time for our cool eather.